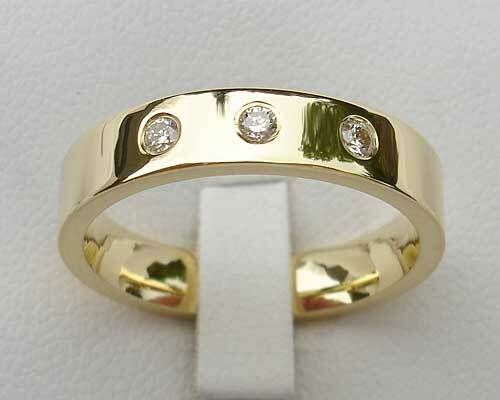 Triple Diamond Gold Wedding Ring : LOVE2HAVE in the UK! 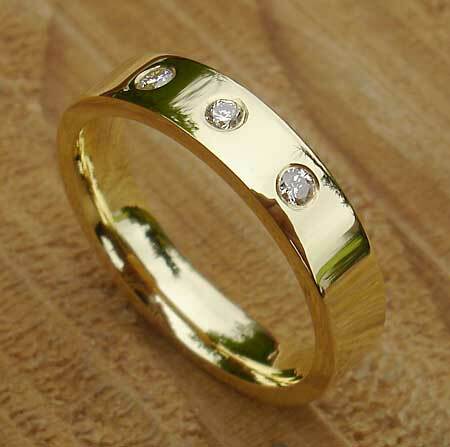 A triple diamond set wedding ring made from solid 9ct yellow gold. The sparkling white diamonds are all rounded brilliant cut in shape and come perfectly spaced apart from one another. A white diamond is the first choice of colour for a diamond wedding ring, signifying purity as it is also commonly known that three diamonds mean 'I Love You'. The diamonds are each 0.04pt in size, and the ring has a width of 6mm with a lovely polished finish. The quality and craftsmanship are second to none, and you can make out the attention to detail in the craftsmanship with the smoothed off edging which means the ring will be comfortable to wear every day. We can also do this ring with other colour diamonds and metals and in a matte finish too, please email us to inquire about these options. Precious stone(s) Available: 3 x 0.04pt white diamonds. Metal(s)/Material(s) Available: 9ct yellow gold.